Other Products: Silver Washi Tape, Charms, cardstock: Purple, Ocre, Dark Blue, Pink, Red, Light Green, Orange, Dark green, Light Blue Creme; Pearl string, Bling on the Roll, Assorted Ribbons and Lace, Rub on Images, Silver Sticker Paper, Button, Assorted Stickers, Paperclip, Brads, Chain, Internet Image, Gold Paper, Clay Charm, Glitter Flowers Ornament, Cut Out Parasailing, Straw, Acetate, Gesso, Die Cutting Machine, Paper Cutter, Ruler, Blade, Scissor, Tape. Instructions: Click here to view more photos of this album. 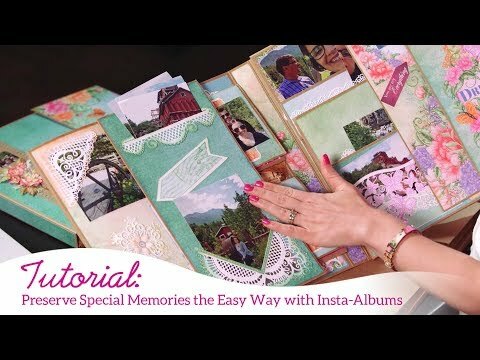 Cover the front cover with purple cardstock, then layer your photo on it. I used Photoshop to add text to my 11 1/4 X 11 1/4" photo creation. Layer ribbons along the bottom. Stamp with Rhubarb Stalk ink the big and smaller peony on white cardstock, color them in the center with Buttercup and the ends with Vibrant Fuchsia, then cut them out with the coordinating dies. Shape them using your Deluxe shaping kit. Make a hole in them and place the stamens in the center. 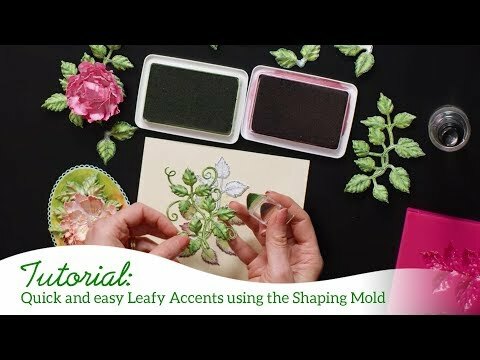 Stamp with Rich Cocoa and the Leafy accents stamp some leaves on white cardstock, color them with Bamboo Leaves and Vibrant Fuchsia, die cut with the coordinating die and place them in the 3D mold, spray with water, put the lid on and run them through the machine. Arrange flowers as shown, adding pearl decorations. For the flap you take a purple cardstock and cut that on the right size, take the filmstrip and place the photo's behind it, glue this down, next to the filmstrip on both sides you can place a double piece of the bling on the roll, then take some Silver Washi tape and fold this over the edge, use 3 strips for this! For the teal flip fold, choose your paper from the paper collections. Mat your photo on red cardstock and place it on the paper., Die cut the Decorative Pocket Accents die from red cardstock and now glue this on the top left corner of the photo. Since the teal paper is too large to fit in the die cutting machine, use your knife to cut a slit in the opening of that die. This will create the pocket. Take the corner die of the Ornate Pocket Accents die and die cut it from red cardstock and glue this on the right bottom part around the photo. Take 2 pieces of chain and glue this under the edge of the corner. Cut a word or sentiment from paper and mat with red cardstock. Glue this on the bottom of the chains to create a sign. 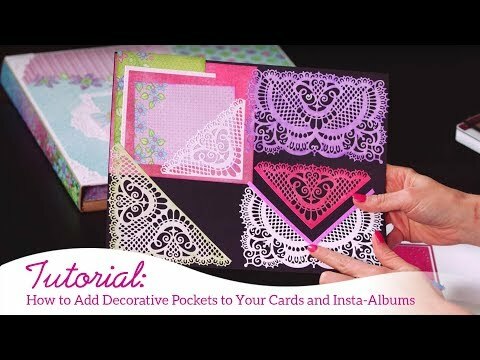 Using black ink, stamp the denim pocket on white cardstock and die cut. Color with Teal Zeal ink, adhere a wooden button on the pocket. Add glue along the edges, without adding glue behind the photo as this will be your pocket. Add tickets, or anything personal, including the denim pocket you've created. Adhere swan sticker and add Crystal Lacquer as water splashes. For the green flip fold, choose your paper and adhere to flip fold. Take a vertical photo and die cut the eyelet border die along the bottom, saving both pieces of the photo. Mat your photo on white cardstock allowing extra space between the die cut. Die cut border along the white opening of the photo mat. Stamp a sentiment from the butterfly collection under due cut border. Die cut the beautiful corner of the Ornate Pocket Accents die from white cardstock and place this on the upper left corner of the photo. Add sentiment sticker as desired. Add paper to remainder of book. Embellish as desired. I die cut the elegant corner pocket from dark blue cardstock and adhered in the lower right hand side and stamped the Oak berry Blossom in Rhubarb Stalk ink, on white paper and die cut. Color with Buttercup in the center and Vibrant Fuchsia ink on the ends and shape using the coordinating mold. Using green cardstock and a scissors fussy cut a palm branch and adhere these in the upper right corner. Add sentiment stickers and images fussy cut from paper as desired. I will place more photos on my blog.